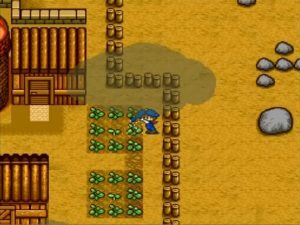 Harvest Moon isn’t the first game about farming (Maxis had SimFarm, because of course they did), nor is it the first “life simulator.” However, it is the first to combine these ideas. 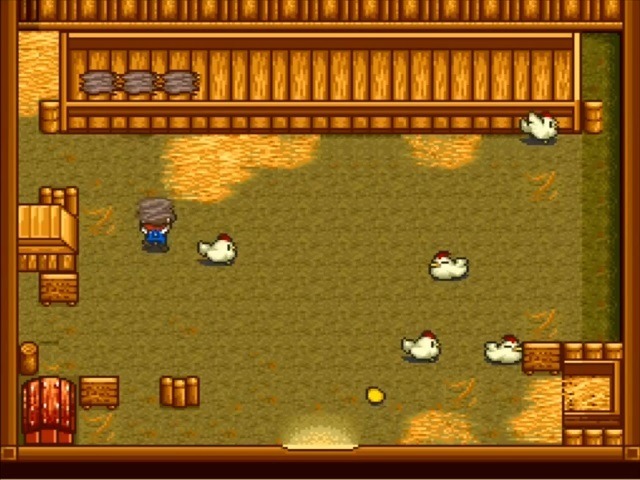 Before The Sims would come along and show that menial work could be fun as long as it was simplified, and FarmVille showed us that people liked to play games at work through an “untraceable” browser window, Harvest Moon took a bold gamble that it could engage players with some very light RPG gameplay based around planting crops and getting married. Crops must be watered, by hand, every day. 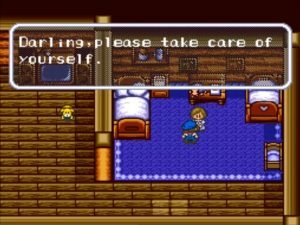 You play as a boy (later games introduce options for girls) whose parents have left him in charge of the abandoned family farm. The place is in disrepair, with empty barns, weeds strewn about, and nary a crop in the ground. You have two and half years to tame the land, after which the game ends and your performance is graded in areas such as money made, farmland cleared, livestock raised, and your overall “happiness.” If you want the best ending, you’ll also need to wed one of the town’s available lasses, expand the farmhouse, and bring two little farmers into the world. Won’t Mom and Dad be proud? Time is your main foe. Days pass at a greatly accelerated rate, with roughly 2-3 minutes between sunrise and sunset. You can keep working after sundown, but stores will close, townsfolk will go inside for the night, and any crops you’re selling are picked up promptly at dusk. If you drop anything into the pickup bin after then, they’ll rot and disappear overnight. You also have an invisible stamina meter draining with the day’s actions. Animations play when you’re running out of gas, until you finally can no longer use your tools and are forced to bed. Turning in each night lets you save your game and refills your stamina for the next day. Seasons factor in as well. There are no months in Harvest Moon, just 30 days in each of the four seasons. Turnips and potatoes can only be grown in the spring, and corn and tomatoes only grow in the summer. No cash crops grow in the fall and winter, so the first two seasons are spent building up a reserve of livestock, who can support your farm through the cold seasons. All crops (except grass, used to feed livestock) are also temporary and must be replanted each year. As you can imagine, running the farm is an expensive proposition. Feed the chickens and they’ll produce eggs you can sell. 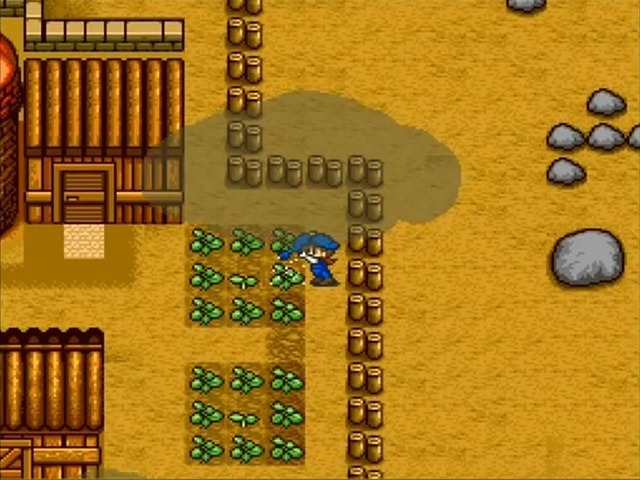 The shortened days and limited time means Harvest Moon is ultimately a game of management. Fairly generous returns on all produce sold means it’s never quite to the point that you’ll need spreadsheets to meticulously track harvests, but you’ll absolutely need a plan. All your many chores should work in service of that plan. You’ll need to remember to water all your crops each and every day, feed any livestock you have, brush any cows you have to produce the best milk, repair your fences after rainstorms, and plant and cut grass to build up a healthy stock of animal feed for the winter season. Then there’s land to clear, stamina berries to find, and stumps to chop up for building materials. All these activities should be working toward increasing your bank account and/or your farm’s physical assets. In short, there’s plenty to do every day, and if you’re not rushing around trying to fit it all in, you’re playing wrong. It doesn’t sound like fun, but the game is saved by how easy doing these activities actually is. Planting seeds is as simple as standing in a tract of plowed land and hitting X to toss seeds in the air. Everything is handled on a grid-based system, with crops always planted in a 3×3 square. Feeding chickens is as simple as grabbing bales of feed and tossing them in the trough. Weeds are pulled with the A button and another press destroys them. Ripe crops are picked up the same way and casually chucked into the shipping bin (don’t miss the bin, or those crops will be destroyed too!). You need to remember to do these activities every day, but actually performing them is quick and straightforward. Upgraded tools even let you water, plow, or cut grass in 3×3 squares with a single button press. By simplifying the process, Harvest Moon lets you focus on the progress – which is where the real fun lies. It’s very satisfying to see your farm come together, and knowing that tomorrow’s harvest will let you finally afford that upgrade you’ve been eyeing hits all the right reward buttons. It’s also fascinating from a technical standpoint. For 1996, this is one of the earliest console games that doesn’t simply reset when you walk off screen and come back. Any changes you make to the farm are persistent, and you have a 60×60 square of land to carve up any way you choose. You can set aside areas for crops, plant fields of grass, fence off a paddock for cows or chickens – it’s all free-form, and contributes greatly to making this feel like your farm. Thanks, sweetness. You’re a real help. The romance mechanic feels half-baked by comparison, and is just as mechanical as growing crops. There are eight available ladies in town, who pretty much differ only by hair color. Your goal is to raise the affection of your choice gal, accomplished by handing her gifts like picked flowers, some of your crops, or fish caught from an extremely basic minigame. Occasional two-choice “conversations” (just agree with them) raise your standing as well, as does dancing with them during festivals held each year on particular days. You can check your progress by sneaking into the girl’s bedroom and reading her diary (yes, and ewww). Five hearts means it’s time to seal the deal. But other than a better ending, having a wife bestows no benefit. You don’t gain a partner to help with the chores; instead, she just hangs around the house and loses affection if you’re not in bed at sundown. Some beautiful 16-bit graphics are on display here, with art that changes for each of the four seasons. Having only three main locations (your farm, the town, and a mountain area) surely makes this variety possible, but it’s still nice to see vibrant colors in the summer, versus orange shades in the fall, and snowy cliffs in the winter. There’s great use of the SNES’ visual filters as well. You have no clock, instead, the screen fades brighter and darker to show the passage of the day. Most importantly, crucial visual indicators, like ripe crops or watered patches of land, are always visible and readable regardless of the hour or season. You can only carry two tools at a time, and I had some initial trouble figuring out which I was picking up from the shed, but the artwork is easy enough to understand once you know what you’re looking for. Though I did spend about a month giving gifts to the red-haired lady of my dreams, before realizing that I had actually been wasting gifts on “courting” the other (ten or so year old) red-head in the village. I guess I’m on some list now, but I hope she enjoyed all the eggs. You’ll have much less to do when winter comes around. 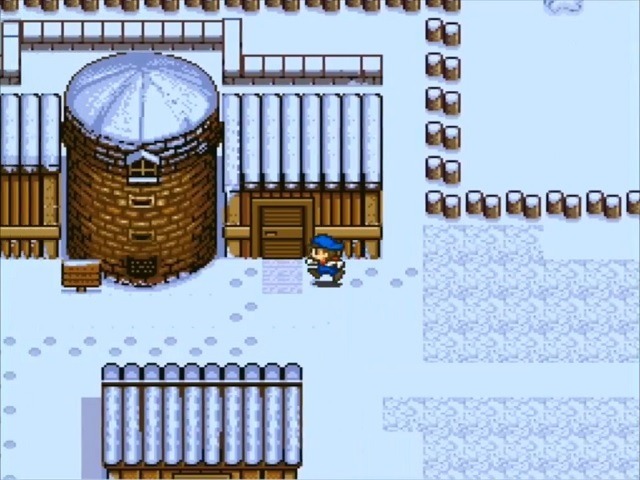 My only real complaint is that Harvest Moon’s not terribly difficult, and as such, quickly falls into routine. There are occasional side missions, such as finding a missing girl, but never any surprises. Crops don’t get diseases, and if you forget to water them, they simply skip that day of growth. Cows and chickens only get sick if you forget to feed them. You don’t have to manage your own food supplies, so the restaurant and “juice” bar are essentially useless in this version. The only element of random chance comes in the form of summer hurricanes or extremely rare earthquakes, which will wipe out some crops and damage sections of fence. These are annoying, but manageable. There are definitely some secrets to find, and some that will reveal themselves automatically over time, but only one small exploration section (the mountain) doesn’t give you much to do outside of your routine. 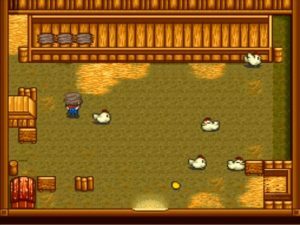 Early games will likely be rough (and don’t be surprised if you consider a restart or two), but once you learn the system and have a stable farm, you’re pretty much just making your rounds each day. I personally started losing interest in the fall, where the removal of crops left me with just the livestock half. It felt like all I was able to do was feed the animals and wait for spring to come. You will surely be able to read all the details above and predict your own level of tolerance. Later Harvest Moons add complexity and refine some of the mechanics, but the first is still surprisingly enjoyable. It’s satisfying to make progress in building up a farm that’s truly your own, without suffering through any of that pesky physical labor. The two and a half year cap is disappointing, but encourages multiple playthroughs, and the multiple endings reward players for improving each time. It is, however, ultimately a game about chores, and as such will not be for everyone. But if you’re curious, give it a try. Tending virtual crops might be more fun than you expect. An early, persistent sandbox that you can set up however you like. Caring for crops and livestock is easy, and the rewards are balanced well. Plenty of reasons to take your experience into repeat playthroughs. Lovely artwork. Wives, children, and your dog are totally useless – just another checklist on the path to a good ending. Can’t keep working your farm after the ending. Simulated chores are bound to get tedious eventually. No problem, this is a Japanese game, after all. Everybody knows that in Japanese games, /all/ women look like they’re ten. It was an honest mistake anyone could have made! Thanks for this review! I had never heard of this one and I love learning about… let’s say less likely gameplay concepts like this one. It sounds like it could be one to check out. This game never looked appealing to me because I always perceived it as ultimately being a kid’s game but, like Sim City, perhaps it might be worth a shot – if I finish all my chores.